Like a PCB layout program, VeeCAD takes a schematic generated netlist and assists you to build a layout - on strip (Veroboard), matrix, donut, tripad, Atarado Smart, and other prototyping boards. The usual design tools are provided: netlist import, component footprint definition, component positioning, wiring and connectivity check. You get full documentation, including a loading diagram, board overlay, parts and wires lists. You can download the free version or purchase the commercial version with color, angled components, net tracing and autorouter. Engineers and hobbyists use VeeCAD for prototypes and small quantity builds, saving hours planning layouts on graph paper. VeeCAD makes prototyping practical where otherwise a PCB is required. 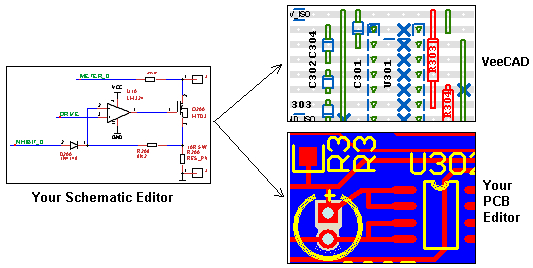 Draw the schematic in your usual schematic editor, and after prototyping in VeeCAD use the same schematic with your PCB editor. Click on parts to drag, rotate, stretch. Break tracks, add wire links and free form wiring. Use almost any schematic editor. Learn quickly with familiar Windows standard controls. Run VeeCAD on Windows XP thru Windows 10 and Wine-Linux-Mac with snappy redraws and saves. Use F1 in most screens for help and illustrated tutorials as you go through the design process. Copy images to the clipboard in bitmap format to any desired scale, for use on website and word processor documents. 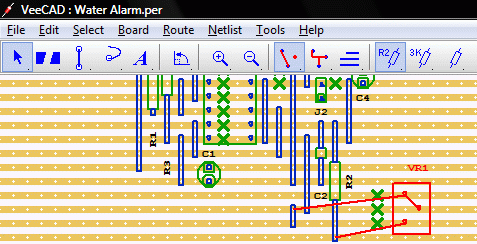 Take the walkthrough, read about schematic editors, try the free version or email the author.